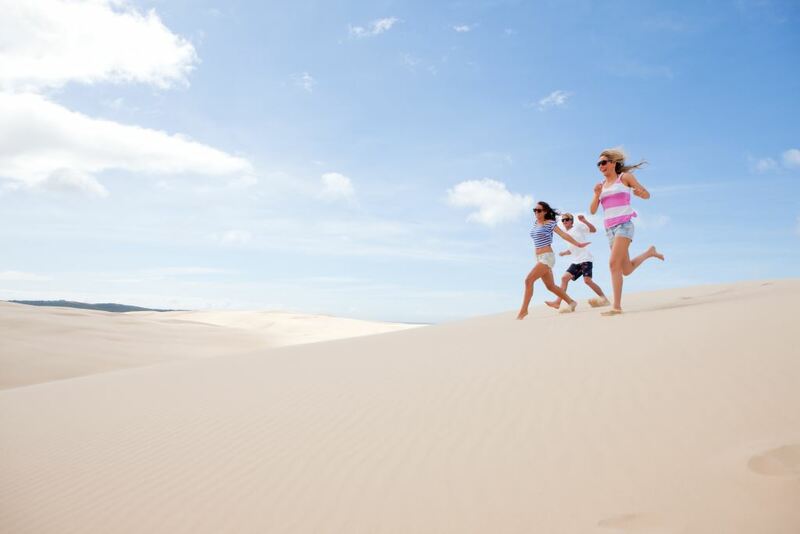 Did you know The Worimi Conservation Lands the largest living sand dune system in the Southern Hemisphere? When next visiting Port Stephens you can not leave without visiting the Worimi Conservation lands. Also known as the Stockton sand dunes, the sheer size and expanse of this amazing natural creation is truly amazing. Starting at Stockton and ending at Birubi Beach Anna Bay makes this a 32km stretch of beach and dunes. When standing at Birubi Beach surf club you look down the beach as far as you can see and to your right are the dunes for as far as you can see, it is like the desert meets the sea. The Retreat Port Stephens backs directly onto the Worimi Conservation lands. We are the only park that backs directly onto the dunes making us extremely unique. Early morning sunrise walks or afternoon sunset walks on the beach are a great way to start or end a day while staying at The Retreat in our range of accommodation options for couples, families, groups and schools. The Worimi People, ‘Welcome you to our Traditional lands, respect our country and sites, and enjoy these beautiful lands.’ The Worimi Conservation Lands are co-managed by the Aboriginal Traditional Owners, the Worimi people, and NPWS through a Board of Management established under the National Parks and Wildlife Act. The Worimi Conservation Lands (Stockton Bight Sand Dunes) cover 4,200 hectares… 1,800 of which are forest as well as 32kms of the longest moving sand dunes in the southern hemisphere. These truly aweinspiring dunes reach heights of over 30 metres with slopes up to 60 degrees to form a majestic alien-like moonscape – a much sought after location for film makers around the globe. These Lands form part of an important cultural landscape with special significance for the Worimi people – the Traditional Owners. The land and waters have been used for many thousands of years for living, gathering foods and for cultural activities. Today the landscape features an extraordinary number of culturally significant sites such as burial grounds, campsites and middens, many pre-dating the arrival of non-Aboriginal people. Thanks to the generosity of the Worimi people we are invited to experience and enjoy this special place (with respect and without disturbing any Aboriginal sites). See this monumental sandscape for yourself by four wh eel drive (with permits), go fishing, surfing, or take an organised tour for quad biking, sandboarding, horse & camel riding and cultural tours including historic sites such as the middens, Tin City and the Sygna. VERY IMPORTANT – check beach closure notices before setting off on your own adventure. Sandboarding …for an exhilerating way to explore the dunes go by off-road vehicle and surf down the 40 metre slopes on custom sandboards. 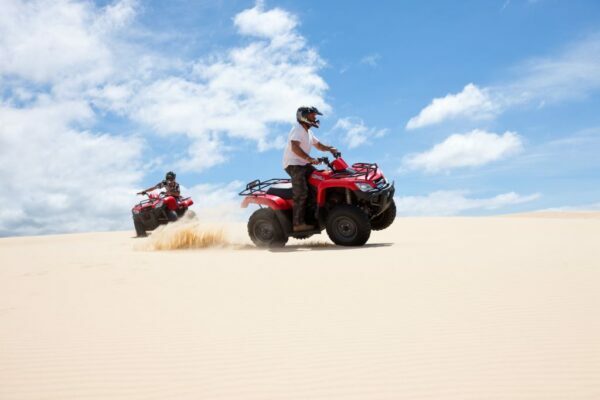 Quadbiking …the ultimate experience for the adventurous… ride from bush to beach across the desert wilderness – safe and sandsational! 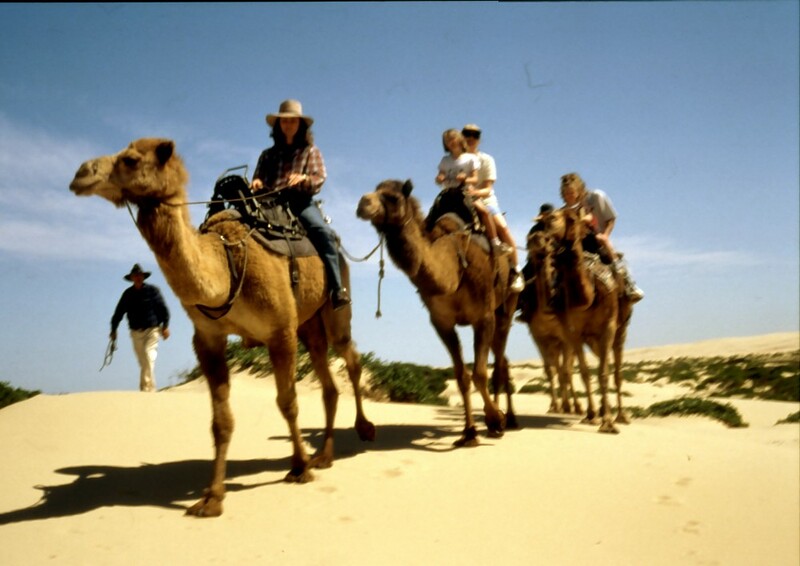 Horse and Camel Rides…Relax and experience the peace and tranquility riding horseback through the bush, over the dunes and along the beach. Surfing …surfers are spoilt for choice along the 32km stretch of beach with point breaks at either end of Stockton and Birubi Beaches. Fishing & Diving …try beach fishing near the Sygna wreck on Stockton Beach or go deeper for a scuba dive adventure of titanic proportions.